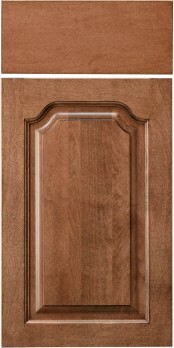 The CRP-60 is a flat-topped, arch door. This results in both narrow and wide doors of this model having the same flat-top whereas, on other arched doors, such as CRP-30, the arch becomes more or less pronounced as the door width changes. All 3/4" & 1" profiles available. Yes - Apply over plywood. Be aware that cathedral and arched doors can look strange in narrow widths and in some cases are not even available (such as on a 9″ cabinet in partial overlay or inset as the door is 7″ or less wide). Plan your design choice around the narrowest cabinet in your plan.